The Menace of the Man O’ Lantern! 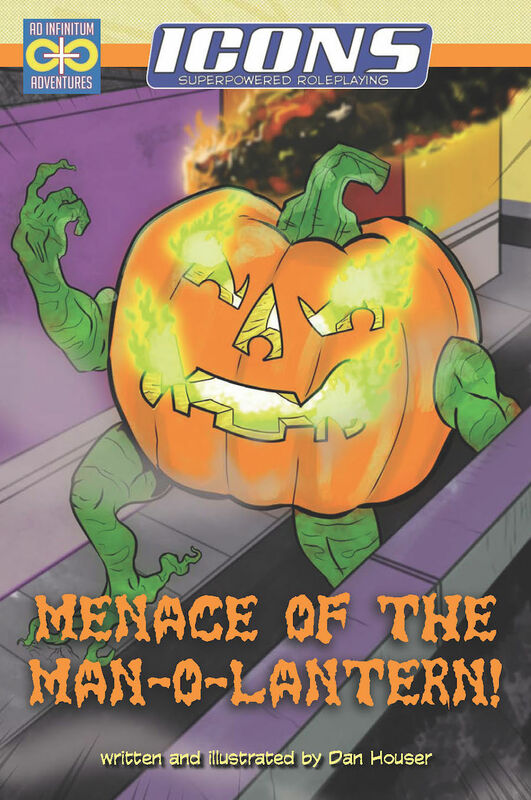 Beware the Menace of … the Man O’ Lantern! Halloween in Victory City, and Crawley’s Confections is sponsoring the largest and most spectacular holiday costume parade seen in decades. That’s when trouble strikes, and our heroes have to confront a mutant menace of truly monstrous proportions, investigate a mystery from the past, and perhaps change the course of a brilliant young man’s future…all while dealing with a giant jack o’ lantern breathing radioactive fire, of course. Written and illustrated by Dan Houser, this adventure for Icons Superpowered Roleplaying is suitable for any group of heroes and an ideal themed holiday adventure or anytime opportunity to pit your heroes against a spooky Halloween menace! Available now on DriveThruRPG and RPGNow!